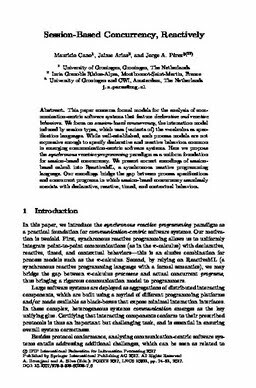 This paper concerns formal models for the analysis of communication-centric software systems that feature declarative and reactive behaviors. We focus on session-based concurrency, the interaction model induced by session types, which uses (variants of) the Π-calculus as specification languages. While well-established, such process models are not expressive enough to specify declarative and reactive behaviors common in emerging communication-centric software systems. Here we propose the synchronous reactive programming paradigm as a uniform foundation for session-based concurrency. We present correct encodings of sessionbased calculi into ReactiveML, a synchronous reactive programming language. Our encodings bridge the gap between process specifications and concurrent programs in which session-based concurrency seamlessly coexists with declarative, reactive, timed, and contextual behaviors.